UPDATE!!! During the weekend of 11/16-11/18/12, a team of Blissful Bedrooms volunteers – TEAM OMAR – made a double dream come true for Omar and his little brother Mario. So many wonderful people came together to help make it happen. Thank you Team Omar and Omar’s Angels for opening your hearts to beautiful Omar and his sweet, loving family. Together, we have forever changed their lives with this act of compassion, and they have definitely changed ours. The ripple effect – well nobody knows exactly how far reaching it will ultimately be, but we expect it will be very big! Please scroll down to see photos of the entire makeover experience from beginning to end! Take note of the amazing craftsmanship and original art work that went into creating Omar’s dream bedroom, i.e, Omar’s soccer ball headboard, footboard and hospital bed enhancements, the graphic design image of a robotic soccer player based on Omar’s favorite team next to his bed, the custom-made desk to accomodate Omar’s wheelchair, the ceiling fixture sculpture, the loft style spaceship bed for Mario, the custom-made window shade, the hand painted planets and more…. It’s hard to believe that this makeover spanned only three weeks from it’s inception (our first visit to Omar’s home) to completion (the Reveal), and that the majority of the work took place over a three day weekend by a team of beyond extraordinary and faithful volunteers! We are very excited to introduce you to Omar, the recipient of Blissful Bedrooms makeover #15! Omar is a very sweet, loving and expressive young man who is 20 years of age. He is challenged with cerebral palsy which makes him reliant on a wheelchair for mobility and completely dependent on others for all activities of daily living, such as eating, transitioning, bathing, toileting, dressing, etc. Omar currently attends a New York City Special Education public school in the Bronx which he will be graduating from this coming June. Life will certainly be different for Omar then, and we hope he will be successful in being quickly accepted to a stimulating adult day program. However, because he will no doubt spend even more time in his bedroom than he does now, we want Omar to be happy and content, and so a team of Blissful Bedrooms volunteers is ready to get to work to give him the bedroom of his dreams. Omar can independently operate a motorized wheelchair in the school environment, and his ability to accomplish this task with his limited fine motor capacity is nothing short of remarkable. He uses a four-point touch switch, which allows him to independently move his wheelchair by gently swiping his fingertips across a surface, even with his extremely limited range of motion and strength. This mode of wheelchair access is not common and takes great focus and a high cognitive level, i.e., Omar is a smart and determined guy! Omar is tube-fed through an opening in his belly and is unable to eat food that has more than a puree consistency. He is non-verbal and is unable to speak any words. However, his eyes speak volumes and anyone who knows him has felt the intensity of his imploring and communicative eyes upon them, even from several feet away. Omar has a communication device, which he uses to express some basic thoughts and needs to others. However, those close to him, such as his devoted family, understand him intuitively and are obviously fluent in the language of the heart. Omar shares a bedroom with his 11-year-old brother Mario. Mario really impressed us when we met him for the first time and watched as he interacted with Omar. He genuinely and wholeheartedly loves his brother just the way he is, and the level of intellectual and emotional intelligence this young guy possesses is simply astounding. We can only imagine what great things Mario will do in his life. After watching the introduction video below, one friend described Mario as an “Everyday Hero” and we would definitely agree with that! So the makeover will obviously be for Omar, the Star of the show, but also for his amazing and supportive brother, Mario, who no doubt is responsible for making the Star sparkle and shine because of the extraordinary love and respect he gives Omar on a daily basis. Omar and Mario live in a modest, low-income apartment with their wonderful parents and their caring grandma. Their graciousness and devotion to the children, and to each other, is inspiring. Needless to say, we are very excited to spend more time in their home, soaking up their love lessons, and we are thankful that they are allowing us to enrich our spirits by doing this makeover for their boys. The makeover will take place during the weekend of 11/16-11/18. Omar shared with us that he likes sports, especially Mexican soccer teams, and one of his favorite colors is red. Mario told us that he loves reading science fiction books, his favorite color is blue, and he is fascinated with the planets. Team Omar will somehow need to come up with a happy compromise and we have no doubt that together our creative channels will flow and merge, resulting in the manifestation of a beautiful bedroom, which we hope will be an oasis of happiness and rejuvenation for both Omar and Mario. Please help us give this special gift to Omar and Mario by making a donation of any amount today. We very much need the help of others to make this happen. Blissful Bedrooms does not have any big sponsors. Our fundraising is very grass roots and each and every makeover is only possible because of donations from many, many people like you. In our opinion, that is one of the most beautiful aspects of our organization, however, it is also one of the greatest challenges we face in manifesting everything we do. Won’t you please contribute today? You can make a general donation to Omar’s makeover via Paypal at the link below or you can donate funds for a specific item. If you would like to lead a small fundraiser to benefit this project, please let us know how we can help you to be successful. Please do get in touch if you would like to donate materials, resources or services and/or if you have any ideas to contribute. Thank you so much for your support of Blissful Bedrooms and of Omar and his family. Please take a few minutes to view the photos from Omar & Mario’s makeover weekend, which include Before & After photos of their bedroom, pictures of the details, the family’s reaction to the Revealing of the boys’ bedroom, the Reveal party celebration with past Blissful Bedrooms makeover recipients, friends and supporters and the volunteers in action transforming the bedroom. Take a look of these gorgeous photos from a family photo shoot that we did with Omar and his family. Aren't they beautiful! They really capture the special love that they share. A selection of these photos are now framed and displayed in Omar and Mario's bedroom so they can fall asleep each night with a heart full of gratitude for all that they have together. In addition, you will see some beautiful photos from Omar's very first "live" soccer game on Sunday, November 11th. Omar had the time of his life on this beautiful, warm afternoon, and the only thing brighter than the weather was his joyful mood. Much gratitude to the Yonkers Portuguese American Soccer Team for opening your hearts and your soccer field to Omar and Mario. Omar proudly sat at the bench with the guys and watched the game intently as his favorite team in red won 5-0!! Every time a soccer player passed the bench, they gave Omar a high-five making him feel like he was part of the team. Omar truly felt like one of the guys, especially with the personalized red soccer jersey they gave him to match theirs. Thank you to all of the compassionate and caring volunteers who shared their time and talents to manifest a Blissful Bedroom for Omar & Mario! Thank you to all of the generous ORGANIZATIONS/BUSINESSES and INDIVIDUALS who supported Omar’s bedroom makeover by donating funds, services and/or materials. This makeover could not have been possible without your help! Thank you to the Companies and Individuals who have adopted Blissful Bedrooms donation boxes, and to the generous and giving customers/people who contributed to the boxes. 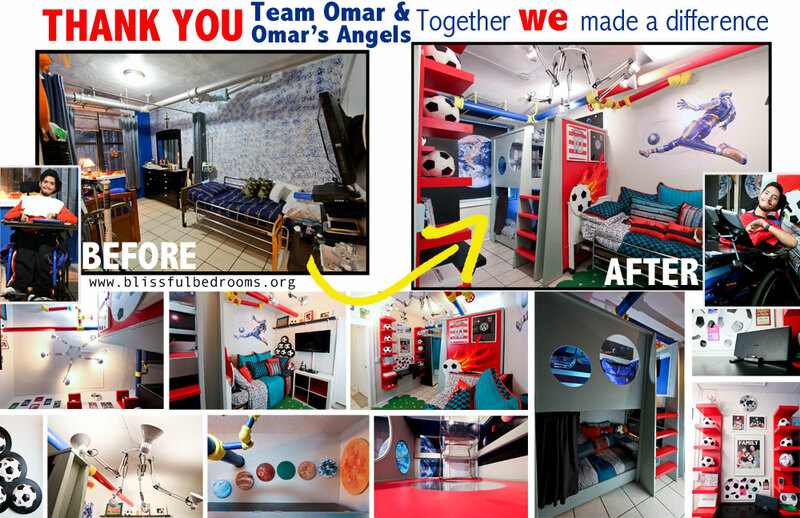 You helped us manifest Omar's dream bedroom!